When studded snow tires first came out, I took 2 tires to Monkey Wards to have them made into studded tires. They did a great job. They have a print catalog, albeit a crumb compared to the former Wards catalog. Montgomery Wards lives on, on the internet. "Montgomery-Ward's sent me a bathtub and a crosscut saw!" --Wells Fargo Wagon song / "The Music Man." 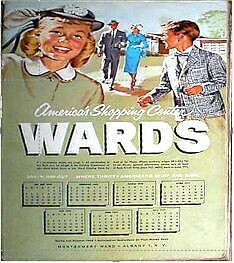 Montgomery-Ward just has their catalog and on-line website. yup, good old 'Monkey Wards'. The one thing I remember is going to the automotive dept. and looking around. They installed air conditioner in my 1976 Ford Courier (Mazda) pick-up and while I was waiting, I was looking at an motorboat that was in the showroom area. Didn't but it, went to boat dealer instead. 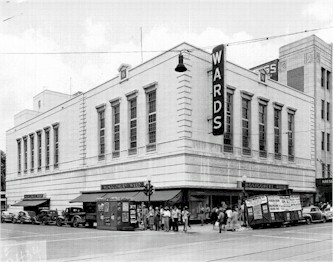 I worked for "Monkey Wards" one summer in the customer service area (repairs, parts). My friend worked in the warehouse where they wore skates all day moving merchandise around.